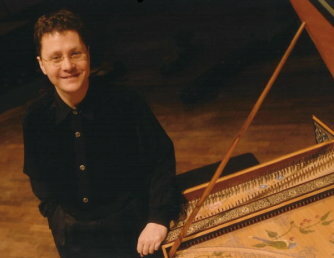 Jory Vinikour is recognized as one of the outstanding harpsichordists of his generation. A highly diversified career brings him to the world?s most important festivals and concert halls as recital and concerto soloist, partner to several of today?s finest singers, and as one of the most visible continuo performers. Born in Chicago, Jory came to Paris in 1990 on a scholarship from the Fulbright Foundation to study with Huguette Dreyfus and Kenneth Gilbert. First Prizes in the International Harpsichord Competitions of Warsaw (1993) and the Prague Spring Festival (1994) brought him to the public?s attention, and he has since appeared in festivals and concert series throughout much of the world. A concerto soloist with a repertoire ranging from Bach to Nyman, he has performed as soloist with leading orchestras including Rotterdam Philharmonic, Flanders Opera Orchestra, Orchestre de la Suisse Romande, Lausanne Chamber Orchestra, Philharmonic of Radio France, Ensemble Orchestral de Paris, and Moscow Chamber Orchestra with conductors such as Armin Jordan, Marc Minkowski, Constantine Orbelian, John Nelson, and Fabio Luisi. He has participated in a recording of Frank Martin?s Petite Symphonie Concertante with the Lausanne Chamber Orchestra under the direction of Armin Jordan (Suisse Romande, 2005), and also performed the Harpsichord Concerto by the same composer with the Symphony Orchestra of the MDR in Leipzig?s Gewandhaus under the direction of Martin Haselböck in January of 2003. Increasingly known as an accompanist, he has appeared extensively in recital with artists such as David Daniels (European tour in 2007), Hélène Delavault, Magdalena Kozena, Annick Massis, Marijana Mijanovic et al. He has accompanied legendary Swedish mezzo-soprano Anne Sofie von Otter in recitals in Sweden, Norway, Spain and Paris and at La Scala in Milan. With luthenist Jakob Lindberg, their programme of English and Italian music of the 17th century, entitled Music for a While was released by Deutsche Grammophon in early 2005.